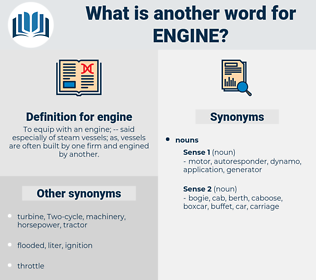 What is another word for engine? 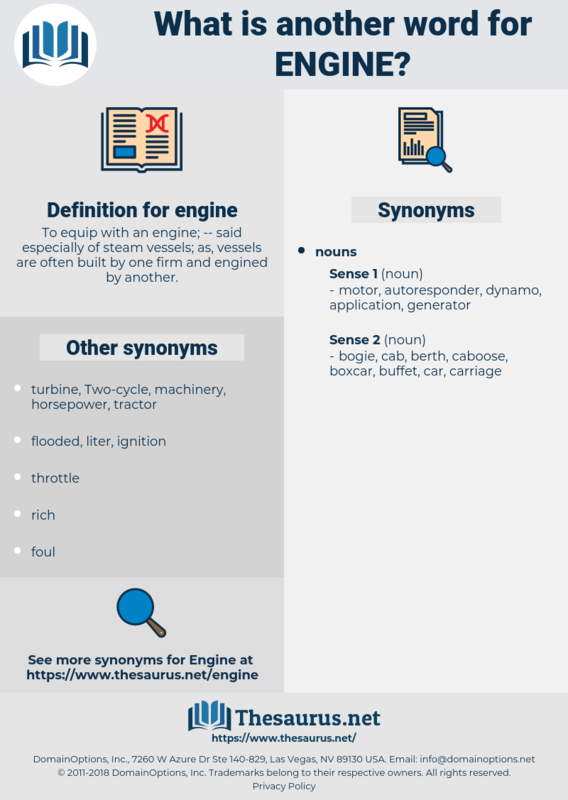 powerhouse, propulsion, lifeblood, mover, impetus, crankcase, ignition, enabler, motive. motorized, motivated, Installed, Got, played. We got into a third class compartment all to ourselves right at the end of the train, near the engine, and there I sat between the two men, who hardly exchanged a word the whole way, but who sat trying to read newspapers by the bad light. Now that the danger was all over, for of course the fire - engine and all those people would save the little brown house, Polly was the last person whom Joel really wanted to see. emission, enigma, e-mycin, enjoin, enchain, encomium, ensign, enzyme. Ballista, reaction engine, arbalest, Mangonel, onager, trebuchet, heat engine, catapult, trebucket, auxiliary engine, generator, aircraft engine, battering ram, arbalist, reaction-propulsion engine, automobile engine, bricole, donkey engine. causal agency, cause, causal agent. gear, geartrain, gearing, train, camshaft, power train.